« What Coaching Means To Me; It’s Today’s Bucs Uncensored Podcast! It’s the weekly, 24-hour Dirk Koetter Confidence Poll. Poll posted today at 7:09 a.m. Find last week’s results linked here. Joe, I realize this has nothing to do with the poll, but I have to ask: amongst the ads I see on the sides of your posts are a bunch of Planned Parenthood ads. Do you have any control of this? The deep out to Shawn Wilson was the last straw for me. He said they barely worked on it. Trying to fit a ball between a lber and safety. Meanwhile, the saints, panthers, rams, chiefs, Vikings ect are all figuring out how to use rub routes in the red zone to free up their shifty backs in space. Get rid of em both. ^deep out in the red zone to be specific. And that is how it will be until the season is over. You see, I support my team, and all parts of it, nearly all the time. The exception being the uniforms, the kickers, and Chris Baker. havent changed in 2years now!!!!!! you werent confident or supportive until the end with the last staff…..lol….stop trolling…..you were trying to run the last regime outta town before the bye week…..
you came on here b!tching every day right along with @realist trashing the staff….. I voted little confidence…..I’m surprised he gets any confidence considering there are daily articles discussing his possible replacement. “real” fans feel the same way you do……love the team…no confidence in dirk..
their are only 3 people voting confidence….. 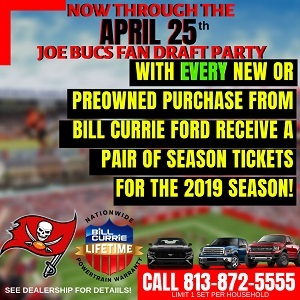 I posted a while back that I’ve a Bucs Fan my entire life, I was born in Tampa, but it’s not about individual players, it’s not about the coaches. it is about having pride in the team and the community they represent, while I do live in Jacksonville I still drive 3 hours 5 to 6 games a year to go home and see the Bucs. I want what’s best for my team and sometimes that is calling a spade a spade. Kotter is not a good head coach, he is a decent offensive coach, but while I still agree that he is decent as an offensive coordinator he is not the head coach that we need. Me wanting what’s best for my team does not mean I have to blindly root for everyone on the team sometimes you have to cut people loose to make the team better as a whole. To continue doing the same thing over and over expecting different results is the definition of insanity and trust me Kotter has caused many of us to go insane that last few years. lol @lunchbox. The ads are determined by google. Google goes back through your cookies and search history and displays ads they think are relevant to you. Been doing some family planning? Are the people voting ‘Totally Confident’ drunk, a family member of Dirk or both? there are people that believe they have to vote positive on everything about the bucs to be considered a true fans, that’s just not true. To me a true fan is someone who will root for the team regardless of how well they are doing or who they are playing. Someone who roots for them to win regardless of what position in the draft you wish they had. Some people want their teams to tank to get better draft position I don’t believe that is what a true fan should do, losing breeds losing. it ruins the confidence of the players that are there, no one wants to end the season on a bad note. draft picks are like buying name brands because you’re too lazy to do the research to find one that is comprable or better than the one that’s advertised. There are more Hall of Famers that were picked outside the top 10 that were in the top ten. Interesting that I get a similar vibe about there seeming to be a disconnect between Licht (the guy “buying the groceries”) and Koetter (the guy “cooking the meal”). I look no further than the curious case of Ronald Jones. I realize many talented college athletes aren’t able to translate their talent to the NFL level, but this guy was always a threat to take it to the house yet he’s given virtually no work in this offense? Yes he hasn’t looked great in the limited carries he’s had as a pro, and yes he hurt his hamstring weeks ago, but you’d think the HC would want to give the GM’s 2nd round pick some more carries to see what they have. I know Barber has worked hard to earn his carries, but he is what we thought he was…a hard runner who can have a statistically solid game against poor run defenses yet struggle against stout ones. I watched how the Vikings got a short pass out to Cook who then took it to the house against the Packers…that’s what I envision a gut like Jones being capable of too. I had the exact same thought when I saw that play ToesOnTheLine. Give ROJO some chances by getting him the ball in space and he will make plays exactly like that. Assuming he catches the ball first – LOL. Seriously though – how many opportunities has Jones had in games this year (including pre-season) to just RUN through a hole and/or make CUTS in the semi-open field which is what he excels at? The answer is NONE! @Danr, no I had my kids 18 and 20 years ago, with no plans to have anymore. I just don’t appreciate having to see baby killers asking for my money when I’m trying to read about my favorite team. Hey, here’s an idea, 813bucboi. Why don’t you find those posts that support your claim of me trying to run him out of town. Even if I had (and I don’t recall it that way), it would not matter. Why? Because people and opinions change over time. Even yours. The next bit of knowledge…supporting a member of this team, be him a coach or a player, does not mean you don’t feel he should be replaced. It means I will not root for him to do badly just so that he can be replaced. The way I see it, if Dirk turns this team around and goes on a winning streak, he would deserve a second look. I want to team to win, so I remain in support of all elements of the team. That’s called being a fan. In fact, as I remember now, I was raising heck because Licht did not share in the responsibility with Lovie at the time. So, now that I remember? I know you won’t find those posts. They do not exist. Not to mention, I NEVER advise firing a coach midseason. Which means during each season, I support the staff. Bonzai I have lost all confidence in Dirk. And guess what? I still support him. I’ve also commented I wanted him fired for an interim. He wasn’t fired and guess what? I still support him. You first post seems to assume that no confidence means you don’t support him. I’m here to tell you that your wrong. Jason Licht is the reason why the team is this bad first and foremost. I have been saying this for years now! If the Buccaneers fail to win more than two more games the rest of the way then Jason Licht’s record will be as bad, or worse, than Mark Dominick. I’ve said it before and I’ll say it again, that should give all of you some pause. Today I learned, that as of this post there are 40 trolls voting Totally Confident.